Now that summer’s arrived, the long awaited prime swimming season is here! To help you make the most of the beautiful days ahead, here’s a list of frequently observed pool issues from the experts at Aqua Pool & Patio and how you can remedy them in order to avoid costly and headache provoking problems. Chances are if you can’t see the sides or bottom of your pool that you have a filtration or circulation issue on your hands. No one wants to swim in unclear water! To address this problem, first you should check that your pump and filter are working properly and that the pump has been backwashed. Next, the most important this is to check and adjust the Ph by having your water tested to determine if its chemistry is not in balance. Cloudy water can often mean sanitizer levels are too low. Lastly, be sure to run your pump after taking these actions until your water starts to clear up. Summer storms can cause debris and other contaminants to make their way into your pool. In turn, these items can unbalance your water chemistry or clog filters and pumps. After every rain, be sure to check in on your pool and conduct routine maintenance tasks. You may also need to shock your pool and circulate the waters for at least 24 hours to reset your pH levels at the appropriate marks after the introduction of rainwater runoff. You should also remove any debris including leaves and dirt that make their way into your pool to prevent damage to your equipment. If your pool looks like a science experiment, the chances are that you have a either a circulation or water chemistry issue. Algae comes in a surprising variety of colors, from green and black to pink and even a yellow mustard color and can cling stubbornly to walls, floors, and equipment causing staining and other damage. Depending upon the colors you see, talk to your local pool professional about the right algaecide to address the issue. With the climbing summer temperatures, that pristine body of water in your yard may attract many different types of creepy crawlies. Local birds and bugs, to yard snakes and frogs can find their way into your pool. It’s important for you to regularly check any place where these critters can accumulate (like filters or pump baskets) and if there’s a massive influx, the excess organic matter may throw your water balance off. You’d be surprised at the variety of colors your pool water can turn depending upon the issue you are experiencing. Basically all colors of the rainbow: gray, green, brown, purple, rust are all possibilities. Depending upon your water’s hue, you should speak to a professional about the proper course of action but most likely the color results from either an outside contaminant or equipment erosion. If you are experiencing a pool issue and need immediate assistance, our professional staff at Aqua Pool & Patio would be delighted to help. 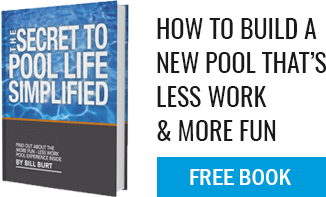 Our Emergency Pool Repair Service is available seven days a week to take care of your needs. Call our service department at (860) 623-9886 for more information and happy swimming to you for a long, relaxing summer!